This post is part of a series: Part 1, Part 2, Part 3, Part 4, Part 5. In this post I'll describe the X server pointer acceleration for trackpoints. You will need to read Observations on trackpoint input data first to make sense of this post. As described in that linked post, trackpoint input data varies wildly. Combined with the options we have in the server to configure everything makes this post a bit pointless as almost every single behaviour can be changed. The linked post also describes the three subjective pressure ranges: no real physical pressure, some physical pressure, and serious pressure. The line between the first two ranges is roughly where the trackpoint sends deltas at the maximum reporting rate (100Hz) but with a value of 1. 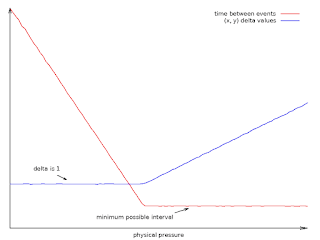 Below that pressure, the intervals increase but the delta remains at 1. 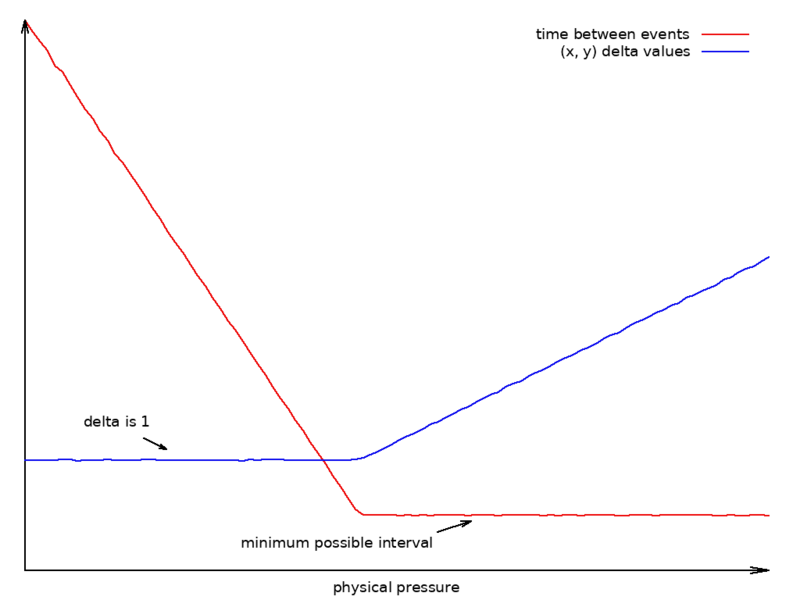 Above that pressure, the interval remains constant at 10ms but the deltas increase. I've used the default kernel trackpoint sensitivity of 128 for any data listed here. Here is the visualisation of how deltas and intervals change again. 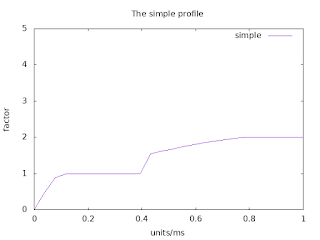 The default pointer acceleration profile in the X server is the simple profile. We know this from the earlier posts, it has a double-plateau shape. On a trackpoint mm/s doesn't make sense here so let's look at it in units/ms instead. A unit is simply a device-specific measurement of distance/pressure/tilt/whatever - it all depends on the device. On trackpoints that is (mostly) sideways pressure or tilt. On mice and touchpads we can convert units to mm based on their resolution. On trackpoints, we don't have a physical reference and we thus have to deal with it in units. The obvious problem here is that 1 unit on one device does not equal 1 unit on another device. And for configurable trackpoints, the definition of a unit changes as the sensitivity changes. And that's after the kernel already mangles it (if it does, it doesn't for all devices). So here's a box of asterisks, please sprinkle it liberally. The smallest delta the kernel can send is 1. At a hardware report rate of 100Hz, continuous pressure to the smallest detected threshold thus generates 1 unit every 10 milliseconds or 0.1 units/ms. If I push uncomfortably hard, I can get deltas of around 10 units every 10ms or 1 unit/ms. In other words, we better zoom in here. Let's look at the meaningful range of this curve. On my trackpoint, below 0.1 units/ms means virtually no pressure (pressure range one). Pressure range two is 0.1 to 0.4, approximately. Beyond that is pressure range three but that is also the range that becomes pointless quickly - I simply wouldn't want to press this hard in normal operation. 1 unit per ms (10 units per report) is very high pressure. This means the pointer acceleration curve is actually defined for the usable range with only outliers hitting the maximum acceleration. For mice this curve was effectively a constant acceleration for all but slow movements (see here). However, any configuration can change this curve to a point where none of the above applies. 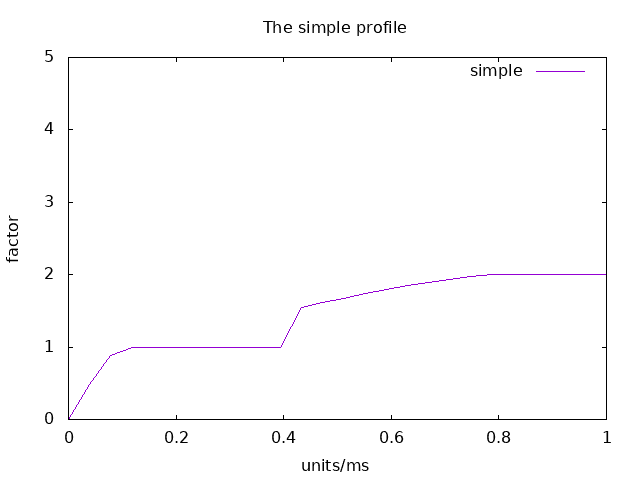 Back to the minimum constant movement of 0.1 units/ms. That one effectively matches the start of the 'no accel' plateau. Anything below that will be decelerated, i.e. a delta of 1 unit will result a pointer delta less than 1 pixel. In other words, anything up to where you have to apply real pressure is decelerated. 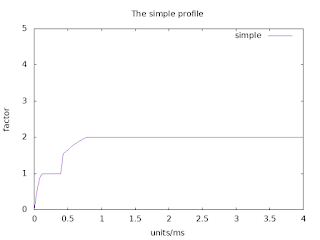 The constant factor plateau goes all the way to 0.4 units/ms. 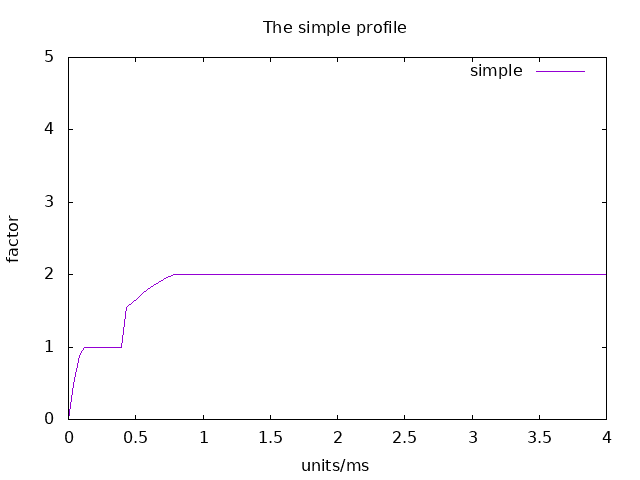 Then there's the buggy jump to a factor of ~1.5, followed by a smooth curve to 0.8 units/ms where the factor maxes out. A bit of testing here suggests that 0.4 units/ms is in the upper limits of the second pressure range mentioned above. Going past 0.6 or 0.7 is definitely well within the third pressure range where things get uncomfortable quickly. This means that the acceleration bug is actually sitting right in the highest interesting range. Apparently no-one has noticed for 10 years. But what does it matter? Well, probably not even that much. The only interesting bit I I can see here is that we have deceleration for most low-pressure movements and a constant acceleration of 1 for most realistic movements. I very much doubt that the range above 0.4 really matters. But hey, this is just the default configuration. It is affected when someone changes the speed slider in GNOME, or when someone changes the sensitivity at the sysfs level. Other trackpoints wont have the exact same behaviour. Any analysis is thrown out of the window as soon as someone changes the sysfs sensitivity or increases the acceleration threshold. Let's talk sysfs - if we increase my trackpoint sensitivity to 200, the deltas coming from the trackpoint change. First, the pressure required to give me a constant stream of events often gives me deltas of size 2 or 3. So we're half-way into the no acceleration plateau here. Higher pressures easily give me deltas of size 10 or 1 unit per ms, the edge of the image above. I wish I could analyse this any further but realistically, the only takeaway here is that any change in configuration options results in some version of trial-and-error by the user until the trackpoint moves as they want to. But without knowing all those options, we just cannot know what exactly is happening. However, what this is useful for is comparing it to libinput. libinput got a custom trackpoint acceleration function in 1.8, designed around the hardware delta range. The idea was that you (or someone) measures the trackpoint device's range once, if it's outside of the assumed default ranges we add a hwdb entry and voila, it scales back to the right ranges and that device is fixed for good. Except - this doesn't work. libinput scales into the delta range and calculates the factor from that but it doesn't take the time stamps into account. It works on the assumption that a trackpoint deltas are at a constant frequency with a varying delta. That is simply not the case and the dynamic range of the trackpoint is so small that any acceleration of the deltas results in jerky movement. This is of course fixable, we can just convert the deltas into a speed and then apply the acceleration curve based on that. So that's the next task, if you're interested in that, subscribe yourself to this issue. This post does not describe a configuration system. If that's all you care about, read this post here and go be angry at someone else. Anyway, with that out of the way let's get started. For a long time, libinput has supported model quirks (first added in Apr 2015). These model quirks are bitflags applied to some devices so we can enable special behaviours in the code. Model flags can be very specific ("this is a Lenovo x230 Touchpad") or generic ("This is a trackball") and it just depends on what the specific behaviour is that we need. The x230 touchpad for example has a custom pointer acceleration but trackballs are marked so they get some config options mice don't have/need. In addition to model tags we also have custom attributes. These are free-form and provide information that we cannot get from the kernel. These too can be specific ("this model needs a pressure threshold of N") or generic ("bluetooth keyboards are an external keyboards"). Overall, it's a good system. Most users never have to care that we even have this. The whole point is that any device-specific quirks need to be merged only once for each model, then everyone with the same device gets to benefit on the next update. The above uses a name match and the dmi modalias match to apply a property for the touchpad on the Dell Latitude E6330. The exact match format is defined by a bunch of udev rules that ship as part of libinput. Using the udev hwdb maked the quirk storage a plaintext file that can be updated independently of libinput, including local overrides for testing things before merging them upstream. Having said that, it's definitely not public API and can change even between stable branch updates as properties are renamed or rescoped to fit the behaviour more accurately. For example, a model-specific tag may be renamed to a behaviour-specific tag as we find more devices affected by the same issue. The main issue with the quirks now is that we keep accumulating more and more of them and I'm starting to hit limits with the udev hwdb match behaviour. The hwdb is great for single matches but not so great for cascading matches where one match may overwrite another match. The hwdb match system is largely implementation-defined so it's not always predictable which match rule wins out in the end. Second, debugging the udev hwdb is not at all trivial. It's a bit like git - once you're used to it it's just fine but until then the air turns yellow with all the swearing being excreted by the unsuspecting user. So long story short, libinput 1.12 will replace the hwdb model quirks database with a set of .ini files. The model quirks will be installed in /usr/share/libinput/ or whatever prefix your distribution prefers instead. It's a bunch of files with fairly simplistic instructions, each [section] has a set of MatchFoo=Bar directives and the ModelFoo=bar or AttrFoo=bar tags. See this file for an example. If all MatchFoo directives apply to a device, the Model and Attr tags are applied. Matching works in inter- and intra-file sequential order so the last section in a file overrides the first section of that file and the highest-sorting file overrides the lowest-sorting file. Otherwise the tags are accumulated, so if two files match on the same device with different tags, both tags are applied. So far, so unexciting. Sometimes it's necessary to install a temporary local quirk until upstream libinput is updated or the distribution updates its package. For this, the /etc/libinput/local-overrides.quirks file is read in as well (if it exists). Note though that the config files are considered internal API, so any local overrides may stop working on the next libinput update. Should've upstreamed that quirk, eh? These files give us the same functionality as the hwdb - we can drop in extra files without recompiling. They're more human-readable than a hwdb match and it's a lot easier to add extra match conditions to it. And we can extend the file format at will. But the biggest advantage is that we can quite easily write debugging tools to figure out why something works or doesn't work. The libinput list-quirks tool shows what tags apply to a device and using the --verbose flag shows you all the files and sections and how they apply or don't apply to your device. As usual, the libinput documentation has details. Thanks to Daniel Stone's efforts, libinput is now on gitlab. For a longer explanation on the move from the old freedesktop infrastructure (cgit, bugzilla, etc.) to the gitlab instance hosted by freedesktop.org, see this email. All open bugs have been migrated from bugzilla to gitlab too, the documentation has been updated acccordingly, and we're ready to go. The new base URL for libinput in gitlab is: https://gitlab.freedesktop.org/libinput/.